This wonderful oversized board book follows mother and baby moose throughout their day. 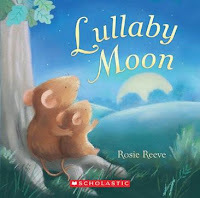 Lyrically written and with great illustrations, this is a fun book to read together either at bedtime or anytime with your special little ones. My 2 year old LOVES this book...she's got it memorized and walks around reciting it aloud. It's precious. This is a wonderful book.